This appropriation funds the at-risk student success program. The at-risk student success grant funds community college programs for students who are labeled “at-risk.” For a student to be labeled “at-risk,” he or she must meet one of the following criteria: (1) He or she must have been placed in one or more developmental course(s) as a result of poor scores on standardized tests or as a result of failure to make satisfactory academic progress; (2) he or she should have been diagnosed by a qualified professional as learning disabled; or (3) he or she should require English as a second language assistance. The majority of at-risk students fall into the first category. The funding method for the at-risk program adds together “contact hours” for developmental and preparatory classes of students and then is divided by a college’s three-year average of all student contact hours. That result is then divided by the total number of contact hours by all community colleges in Michigan. The equals the share of funds directed to that community college for “at-risk” students. Each school also receives a base grant of $40,000 for its at-risk program. This program should be eliminated. Providing extra assistance to students, whether “at-risk” or not, is best handled by individual, family and community efforts, not state government. Funding of at-risk student programs in community colleges promotes a perverse system of incentives and rewards. Under the current system, a student who puts very little effort into a class and fails may be eligible for special treatment, whereas a student who puts forth a strong effort but only earns a C may not qualify. This program can actually subsidize poor performance by rewarding community colleges with additional funding. According to Rhonda Burke of the Michigan Department of Career Development, community colleges are free to change their interpretation of the guidelines for at-risk students in any particular year. The state does not have a standard mechanism for community colleges to assess which students are “at-risk” and which are not. This gives community colleges wide latitude on how many students it assigns to developmental classes. In addition, community colleges need not spend their additional “at-risk” monies on students themselves. Grants from this program may be used to fund building and technology upgrades such as new computers and software from which all students, faculty, and administrators’ benefit. 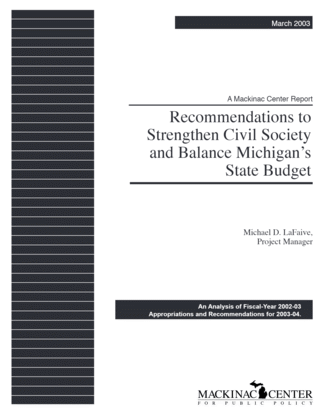 During fiscal year 2001 Northwestern Community College in Traverse City used all of its at-risk funds for updating “technology related equipment and software.” The annual report for the program clearly states that the “purchases need not be associated with the operation of a program designed to address the needs of at-risk students.” In another example, C.S. Mott Community College in Flint allocated 42 percent of its at-risk funding to updating its “Reading Labs” and classrooms. Savings: $3,692,103.